We wake up to more blue skies and sunshine. Mr Fletche’s trusty weather app says “intermittent cloud” – at the moment there is not a cloud in the sky. Intermittent or not. We amble down to breakfast and discuss our plan for the day. Today we’re going to use the handy train to village-hop, spending a little time here, having a drink there, having lunch somewhere else… we’re going to expend as little energy as possible today, letting the local trains do all the work. The first set of steps out of Monterosso are a killer. There’s a hotel up here – despite the beautiful panoramic views from its terrace I’m mighty glad we didn’t stay here (although I possibly would have come home with thighs like Beyonce’s…). We pass the point of no return – also known as the point that we have to pay for a hiking pass. 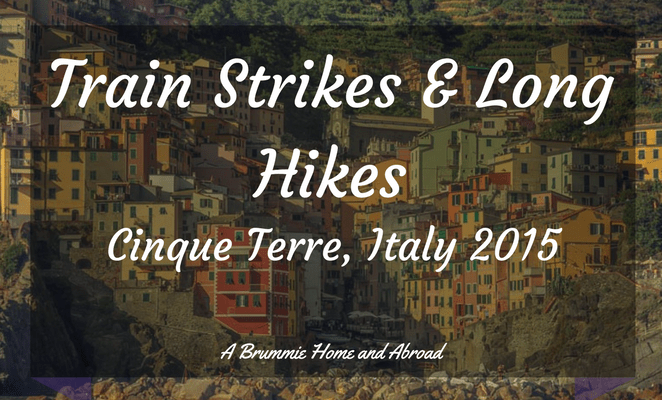 Yes, you have to pay 7,50 euro each for the pleasure/torture that is hiking. Once we’ve handed over our precious money, we know we can only stubbornly continue onwards. And upwards. Eventually, we get our first view of Vernazza, with its inviting blue-green sea and pastel coloured houses. Surely now we must descend? Nope, there’s still a few more steps to climb… this is where it starts to get tough, knowing we must be so close, and yet showing no signs of descending. Finally though, we reach a series of uneven steps, the type where you have to watch every placement of your foot, where a waist-high step is followed by one just an inch high. Coming down is every bit as intense a work-out as going up. More so, as it’s as much of a mental challenge as physical. Every glimpse we get of Vernazza coming ever closer spurs us on though, and eventually we’re passing the checkpoint at the other end, and descending a narrow staircase through pink and orange alleyways. We practically fall into the chairs of a handily placed caffe and order the most welcome Aperol spritz of our trip yet. It has taken us exactly two hours, spot on the time for a “relatively fit hiker” according to that handy trail map at the other end. And that has included lots of stops for photo opportunities (codeword for rests). We are extremely proud of ourselves. We order focaccia for lunch to extend our sitting down time a little more. Despite my earlier intentions of attempting the return hike, I am now hoping desperately that the train strike does indeed end at 5pm and we can return home in relative luxury. However, 5pm is still a couple of hours away, so we give our limbs a tentative wiggle, surprised that all are still in working order, and have a wander around the town. We are grateful that the town is small – just one street between the railway station and the waterfront! We do foolishly decide to climb the steps up to Castello Doria but then decide not to pay the nominal admission for the final panoramic views. We sit on the waterfront, and remain in our rather exposed spot during a quick rainstorm (luckily I have that handy ombrello from Florence with me!) The sun soon peeks back through those pesky intermittent clouds; the fervent sunworshippers have barely moved from their spots on the tiny beach. We stop for a drink, and for a yummy gelato from Gelateria Vernazza before checking out the train situation. The trains are “definitely almost maybe” going to be running after 5pm. The platform is already crowded with tourists seeking to escape from this lovely town. We have time for Mr Fletche to go off on a quick photographing tour whilst I perch on the steps at the waterfront and read my book for a while. This was the nice relaxing activity I had planned for today! Finally we join up with the masses at the station, hoping that the 5:20pm train is a) going to stop at Vernazza and b) is going to stop at Monterosso. Success on both counts! We’re finally back at home base and we make our way back to the hotel for a much-needed shower and change of clothes. "“Oh I do like to be beside the seaside”: Cinque Terre, 2015"
"Village Hopping and Final Musings: Cinque Terre, 2015"
It looks brilliant. When there is sound of your groans to accompany the pictures it will be amazing. Well done!! true; be quite something I expect!! This sounds like a perfect day for me. Especially as you finished with such lovely seafood! It is pretty cheeky that you have to pay to hike though! Is that to help maintain the steps and paths?? It was a perfect day…even the drop of rain couldn’t stop us! And seafood and Aperol Spritz was pretty much my staple diet in Italy for two weeks! I wouldn’t mind if it goes towards upkeep! If it is just a clever person barring the way and taking money, that’d be annoying!